...... The program also remembers the location and layout of your desktop icons, and it correctly restores them as you move among display settings. UIFriend's desktop icon layout protection feature ensures that your desktop layout is protected from those frequent but unexplainable times when your desktop icons turn to scrambled eggs. 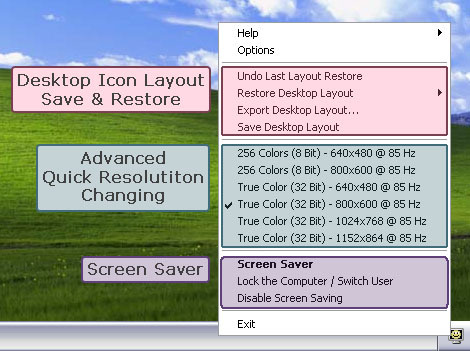 You'll enjoy the peace of mind that comes with knowing your desktop layout is protected. Qweas is providing links to UIFriend 2.3.1 as a courtesy, and makes no representations regarding UIFriend or any other applications or any information related thereto. Any questions, complaints or claims regarding this application UIFriend 2.3.1 must be directed to the appropriate software vendor. You may click the publisher link of UIFriend on the top of this page to get more details about the vendor.